Pallets are used for heavy items, large items or a collection of goods that are being shipped together. They support the weight of the item(s) you are sending then slotted in to an appropriate shipping vehicle to get your goods to their destination securely. Forklifts and hand operated Pump Trucks are used to lift and manoeuvre the pallets. In order to book a pallet delivery you must supply your own pallet and wrapping, and make sure the goods on the pallet are secure and stable for transportation as the whole pallet will tilt when lifted. You can get an instant quote online for UK and most European pallet deliveries and book it now. International shipments, bulk orders are quoted by our Sales team who will scout around for your best price, by air or sea: Get a quote now. What pallets can I use? 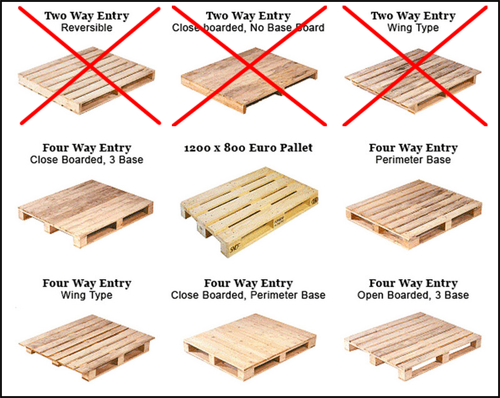 You can use Standard UK and Euro Pallets as shown below, these are the most common pallets available. You can not use USA or “Brick Pallets” as shown below. Your pallet will need to be collected and delivered with the use of a hand operated pallet truck and then moved through the network using forklifts. Standard pallets, as shown below, are designed to be used by both. What are the weight and dimension restrictions? You can send goods that are longer or wider goods than 120cm x 100cm on a single or double pallet. This would be referred to as an Oversized Pallet. To book such a pallet you would need to calculate the number of pallet spaces, your goods would take up and book the correct number of pallets accordingly. Firstly you would need to know the maximum length of your goods and divide this length by 120cm, anything over 1 (e.g. 1.45) would need to be 2 spaces, anything over 2 (e.g. 2.34) would need to be 3 spaces. You can go unto a maximum of 3 spaces long and 2 spaces wide. For example if your good/s are 200cm long they would take up two pallet spaces (¼, ½ or full would depend on the height and weight). If your goods where 150cm wide they would take up two pallets spaces. If your goods were 200cm long and 150cm wide, your goods would take up four pallet spaces (2 pallet spaces long and 2 pallet spaces wide), again ¼, ½ or full would depend on the height and weight of your goods. If you have any doubts at all, please feel free to contact us on 01792 80 40 40 and one of our team will be only too happy to help and advise. If you have a non-standard size pallet for UK or international delivery, we can get you a tailored quote for this: Please contact us on 01792 80 40 40 or 0333 678 00 00. Restrictions on size and weight vary depending on the service you choose. The size and weight allowance is clearly shown whilst placing your order. It’s important you stick within the size and weight allowance, otherwise you will be liable to pay a surcharge. For example, if you book a service that allows a maximum length of 1.2m, but the goods you send have a maximum length of 1.5m, the network will detect this with their scanning equipment used to process every consignment. The same will be true of height, width and weight. If your goods exceed the dimensions and/or weight allowed, you will be liable to pay a fee since the larger size was not declared at the time of booking. Therefore, please make sure your calculations are accurate at the time of booking a delivery service to avoid any surcharge. Surcharges will be charged at the same rate as a new order for the correct dimensions, weight and size. In other words if your goods are larger than the allowed size or weight and are calculated to have take up 2 spaces instead of 1. You will be charged the difference between the price of the 1 space that you booked and paid for and the price of 2 spaces that your goods actually took up. What happens if my goods overhangs the pallet? If you have a particularly large item you can book extra space to accommodate this. Physically, only one pallet can be lifted for transportation, but you can book space on the lorry for the width and/or length of two pallets. Please refer to the section on Oversized Pallets in the What are the size and weight section of the FAQs. Overhang is overhang, whether it is 1cm or 10cm - if your item is not fully contained within the pallet base then it does not fit. Pallet lorries load pallets side by side in rows. If your goods overhang your pallet it means another pallet cannot be slotted in next to it and you will be charged for this extra space. If your item overhangs the pallet, you can book space for two pallets to accommodate this. However, pallets are lifted by a forklift, which only has two prongs. This means only one physical pallet can be lifted at a time.The maximum extra space allowance is two pallet wide (200cm) and 3 pallets long (360cm) The weight and nature of your goods will also play a part in whether or not your goods can be transported in this way. Any doubts you may have, please contact us on 01792 80 40 40 and a member of our team will be only too happy to help and advise. If your item overhangs the pallet and you haven't booked extra space, either your pallet will not be collected at all, resulting in a failed collection charge, or your pallet will be collected and you will be liable to pay a surcharge. Either way, you will need to pay extra for your shipment. Can I load my pallet at either angle? You can orientate your goods any way you wish, providing they sit within the space you are booking and are secure and stable on the pallet. Once again, please be mindful that any overhang will impact on the carriers ability to carry the maximum number of pallets. This becomes particularly important and critical on the journey to and from the main hub. How does the size of my goods effect the price that I pay? All pallet networks work in the same way, with all consignments going through a central hub. Regardless of where your goods are collected from or are delivered to, they will be transported to and from the main hub in a double decker arctic vehicle, known as a "Trucker". These vehicles are designed to carry a specific number of pallets and are based on a standard pallet dimension of 100 cm x 120 cm. Regardless of the size of vehicle that collects your goods or the amount of space available in that vehicle, if your goods take up more space than you have booked it will effectively result in the truncker vehicle carrying less pallets and therefore you will need to pay an additional charge for the actual space your goods take up. This charge will be calculated on a pro-rata basis, depending on the number of spaces calculated, at the same rate as your original order. How do I measure my consignment? When calculating the size of your goods, it’s important to measure the widest point, the longest point and the highest point. These three dimensions will then be used to calculate the cubic dimension of your goods. This is particularly important when dealing with odd or irregular shaped goods for example Farm Equipment. Regardless of the shape of the goods you should always be able to calculate the cubic dimensions of the goods overall, by following the simple instructions above. The overall height of your goods should be measured from the floor and include the height of the pallet. The weight of most goods can be looked up using a search engine such as Google or Yahoo. The average wooden pallet is approx. 25kg’s this should be added to the weight of your goods. How do I convert from inches to centimetres? How do I calculate the weight of my goods? The weight of most goods can be looked up using a search engine such as Google or Yahoo. The average wooden pallet is approx. 25kg's this should be added to the weight of your goods. What do I do if my goods exceed the size or weight stated? Couriers are not expected to lift heavy items in to the van for collections or deliveries, on their own. This is in line with health and safety requirements and generally respectful of their wellbeing. Dimensions longer or wider than a single pallet can be booked as multiple spaces. However, for goods that are higher or heavier than allowed, please call us on 01792 80 40 40. Can I send an engine? Yes engines can be sent by pallet by most carriers, should this not be possible you will be notified before collection takes place. However, please be advised that all engine and car parts must be complete drained of oil and any sump bolts tightly replaced. The networks take oil spillage and leakage very seriously and the any leaks and spills will be charged for depending on the amount of clean up required and any damage caused to the vehicle or other goods. This charge can be high and we would highly recommend avoiding such charges by referring to our Engine Shipping Guide and ensuring that your engine is packed correctly and fully drained of all oil or fluids. It is the responsibility of the bill payer to ensure that all goods are correctly packed and fit for transport. How is my pallet handled in transit? Ensure your goods are stacked in a stable manner. If your goods are unstable or move at all, they are likely to fall and get damaged. Ensure your goods are secured to the pallet, once again minimising the chances of your goods falling off the pallet during transit. Shrink wrap your goods to protect against neighbouring pallets. You should always photograph your goods on the pallet before and after wrapping and securing, for verification and identification purposes. This will only take a minute and can save a massive amount of time, money and effort in the long run. Practically everyone has a camera phone these days. We are not expecting a David Bailey production with lighting and perfect balance, a couple of simple in focus photographs showing the state and condition of the goods before and after packing will suffice. For identification purposes, please print or hand write 3 to 4, A4 labels clearly stating the contact name and the delivery address. Apply these to each of the exposed sides of the goods. The purpose of these labels is solely for identification purposes in the event that you pallet is cross labelled or mislaid. It is the sole responsibility of the collection point to ensure that the correct goods are given to the collecting driver. If your goods are not suitable to be stacked, please take steps to indicate this. The simplest and most effective way to do this is to secure an irregular shaped object to the top of your goods. This can be as simple as an empty cardboard box and will simply, quickly and clearly indicate to a folk lift driver that goods can not be stacked on top. Ho do I wrap my goods to protect them from damage? This obviously depends on the type of goods themselves. Although, if you keep in mind the journey that your pallet is about to go through (as indicated above). Common sense should be used at all times in regards to protecting your goods and different material including bubble wrap, you may also consider old carpet, cushions or an old mattress depending on the goods in question. Just keep in mind that common sense is always best, and over protecting your goods is far better than under protecting them. Should I send fragile items on a pallet? Whilst every care is taken to deliver your pallet in the same condition as it was collected, fragile item are not ideally suitable for transport through a pallet network. For this reason glass items or glass components are not covered under any insurance provided by ourselves or our couriers or agents. Should you decide to send any fragile items we recommend extra care is taken when packing and securing this items. Where can I buy packaging material? Many packaging items can be found on eBay or similar sites. Please find a list below of links for some of the materials that are available. This is in no way an endorsement or recommendation of the goods supplied by these companies. When will my pallet be collected? Please note: We only collect on working days. AM/PM or timed collections as well as deliveries are available at the time of booking. We are not able to indicate ETA’s (estimated time of arrival), unless a timed collection is booked and paid for. Although you can request a call 30 minutes before collection, which should give you time to be at the collection point or make arrangements for someone else to be there. Please ensure that the phone number you provide is correct and that the phone is switched on and available to receive calls. Please Note: Should a collection driver arrive at the collection point and your goods are not available for any reason we will be hit with a Failed Collection Charge (FCC) by the collecting network and we will have to pass this charge onto you. When will my pallet be delivered? An economy service typically takes 3 - 4 days from collection, therefore a pallet collected on a Monday should be delivered Wednesday/Thursday. Please note that we do not deliver on a weekend unless a Saturday AM delivery is booked and paid for. Therefore, a pallet collected on a Thursday would not be expected to be delivered until Monday/Tuesday. A Next Day service typically takes 24 hours. Therefore a pallet collected on a Monday should be delivered on a Tuesday. Please note a Next Day pallet collected on a Friday would not expect to be delivered until Monday, unless a Saturday AM delivery is booked and paid for. We are not able to indicate ETA’s (estimated time of arrival), unless a timed delivery is booked and paid for. Although you can request a call 30 minutes before delivery, which should give you time to be at the delivery point or make arrangements for someone else to be at the delivery point. Please ensure that the phone number you provide is correct and that the phone is switched on and available to receive calls. Please Note: Should a delivery driver arrive at the delivery point and there is no-one available to receive your goods or no arrangement has been made to leave your goods, we will be hit with a Failed Delivery Charge (FDC) by the delivering network and we will have to pass this charge onto you. Can I have my goods collected and delivered on the same day? Yes you can, but this would need to be arranged as a "Direct Run" cost for this would be a lot higher than services quoted on our site and can be obtained by calling our sales team on 01792 80 40 40. Can I choose a collection window or time? Yes you can, when making your booking you can choose from an AM collection or a Timed collection. Both these options are chargeable and the price for each is clearly shown on the booking form. Simply tick the timed delivery option and choose the time slot you need your goods to be delivered. The same option is available for deliveries. Can I choose a delivery window or time? Yes you can, when making your booking you can choose from an AM delivery or a Timed delivery. Both these options are chargeable and the price for each is clearly shown on the booking form. When will the courier arrive and what happens if they don't? This will depend on the service booked. Please see Q1. for timescales. We are unable to give out ETA's and often we are unable to contact drivers whilst they are on-route. Collections take place between 09:00 to 17:30 Monday to Friday. If your pallet has not been collected within the allocated timescale for the service you have booked (please check Q1. above) then please let us know by contacting us via our "Live Online Chat", this is the quickest, easiest and most efficient way of communicating with us and will ensure that you get dealt with as quickly as possible. Most drivers will not take unattended goods unless they have been instructed to do so ahead of time. Any unattended goods are left at the customers own risk and neither Palletised shipping services Ltd or any courier or agent appointed by us will accept any responsibility in the event of your goods being lost or stolen. Is the serviced I’ve booked a Guaranteed Service? None of our services offered online are Guaranteed, although every effort is made to collect and deliver within the target timescale stated for each service. Should you require a Guaranteed Service please contact our dedicated sales team on 01792 80 40 40 and they will be happy to help. Please be aware that Guaranteed Services will increase your shipping costs dramatically. Which areas are not included in UK Mainland delivery? When you book a collection or delivery to or from any of these areas, please be aware that timescales will invariably increase, as will the likelihood of possible delays. Once again, every effort is made to ensure a swift and efficient service wherever possible. Guernsey postcards are GY; Jersey is JE. PO is the Isle of Wight, IM the Isle of Man and some TR postcodes the Isles of Scilly (some TR postcodes are for Cornwall and the mainland). The restriction includes Northern Ireland and postcodes there are BT. The areas that perhaps cause the most controversy are the Scottish Highlands. Although they are only marginally separated from the mainland, which is an area of contention itself, PA and PH postcodes are excluded from the mainland, as are IV, HS, KA, KW and ZE postcodes. This is simply because these areas take more time to reach. Since they are also not so densely populated, collections and deliveries are less frequent and therefore becomes a more expensive journey due to lack of volume. Can I arrange a time for delivery? Yes you can. Time slots or AM deliveries are available at an additional cost whilst you are completing your order. Simply tick the timed delivery option and choose the time slot you need your goods to be delivered. The same option is available for collections. How can I track my pallet? The quickest, easiest and simplest way to track your pallet is to use our Live Chat option, where a team of advisors will be standing by to answer your questions. What happens if my goods are not delivered? Delivery for Standard economy or Premium booking is any time between 09:00 - 17:30 and unfortunately we cannot get information from couriers when they are out en-route. This means we can not offer you an ETA. If your goods have not been delivered by 17:45 on the expected day of delivery, please let us know as early as possible the following day, using our “Live Chat” facility in order for us to establish the reason and make arrangements for the delivery as quickly as possible. Thankfully, the majority of deliveries go through without a hitch, but sometimes a delivery fails and this can be for a number of reasons. If you missed a delivery and would like it re-booked, we can arrange this for you. In the majority of cases we will be notified of a failed collection/delivery and will take the necessary steps to resolve the issue. Please be aware that in instances where a delivery fails through no fault of the delivering depot charges will be incurred by us, which will be passed on to the billing point. If it is presumed that no attempt for delivery was made to the delivery address, we need to find out why. Let us know straight away and we will contact the relevant courier network on your behalf and get back to you with their response. We will see any issues through to their full conclusion. Pallet networks deliver thousands of pallets daily and their delivery vehicles are usually pretty big. It is important that drivers have clear access to the addresses you’ve given for both collection and delivery. They will struggle to get down narrow roads or driveways with little to no leeway or under low arches or bridges, for example. We do not want you to experience any delays with your services, therefore if you envisage any access issues please advise us of so in the “Extra Information” section of your booking and alternative arrangements can be made before hand. In such circumstances you should arrange for your pallet to be collected from a solid, stable surface (such as tarmac), You can also arrange for the pallet to be placed on a thick plywood sheet and create a runway of plywood sheets from the pallet location to the vehicle. In the situation where an incline or decline could cause an issue, you could arrange for additional man power to be on hand to help with the loading/unloading or move the goods to a flat accessible area. What about weekends and Bank Holidays? Saturday Deliveries are available in most instances at an additional cost and can be booked (where available) as part of your original order. Saturday Collections are not available. Sunday & Bank Holiday collections or deliveries are not available. Unfortunately, we have no control over adverse weather conditions and delays are bound to occur both during and after such an event. Every effort will be made to limit the delay and inconvenience to yourself as much as possible. Other unforeseeable events which could cause similar issues would include road traffic accidents, strikes or protests. Once again, every effort will be made to limit any delay. A POD is the industry term for a Proof of Delivery. This can be in paper or digital format and a driver will ask the person receiving the goods to sign for them. Once signed this document establishes that the goods were delivered to the correct address and in good condition. We would strongly advise that upon delivery you check the external packaging of your goods to ensure that the packaging is in tact. Should there be any damage spotted you can still sign the POD but must make a note of the damage and a brief description of the damage. It is also very important to take photographs of the damage in question as this will be needed by the insurers. Am I covered against loss or damage? Every order is covered by a free insurance cover of up to £1,300.00 per metric tonne (£1.30 per kilo) higher levels of insurance cover can be purchased to cover both weight or value. This can be booked online as part of your original order. You will not be covered for prohibited items such as (but not limited to) Glass (either as a whole or as a component) China or other fragile, dedicate materials. For a list of excluded items please check our Consignment email, sent to you automatically after your booking is completed. If in any doubt, please feel free to ring us on 01792 80 40 40 to check that your goods are covered. We do not accept any responsibility for the transportation of live/perishable animals, plants, food or drink is entire at the customers own risk and the carrier accepts no responsibility to the damage or deterioration of these in the event that the service is delayed for any reason. What if I'm not the sender? If you're buying something from an online trading store like eBay or Amazon, but you're arranging your own shipping because you know it's cheaper with PSS, this is easily done with our instant booking system, but you need to make sure the sender understands the packaging requirements. We encourage our customers to protect themselves when doing this because no level of insurance will cover a badly packaged item. As the person organising the shipping it is your responsibility to check that your arrangements for packaging and insurance are in order. However, for a damage claim to be successful, you must be able to show that your item was well packaged in the first place and protected for the journey. If an item was sent without padding or in an ad hock manner, for example, then a claim for damage in transit is unlikely to be considered. Not all sellers on eBay, Amazon or any other trading store are businesses and they may not have used a pallet network service before, so it is your responsibility to check they understand the packaging requirements for the collection service you book. This is not something we or the courier will take responsibility for. We would strongly advise that you forward our packaging guidelines on to them, this would be emailed to you shortly after you have successfully completed the booking request. It is important you work in partnership with the seller to make sure your delivery arrives in one piece. We will not become involved in damage disputes of this nature. Where an agreement on packaging or labelling has not been met with either party, we cannot resolve this issue on your behalf. However, where a claim needs to be made for loss or damage we gladly accept evidence from either party (sender or receiver / seller or buyer) to support the claim. Any settlement will be paid to the person who booked and paid for the courier with PSS. When arranging your own shipping, make sure you arrange for the shipping labels to be sent on to the sender in time for collection and that they use them. If your goods do not arrive at its destination on the day/s it’s due, you need to let us know as quickly as possible the following day or within five days from the collection date. Immediate notification gives us the best opportunity to contact the network company who can then speak to the driver and search the relevant depots in case the pallet has been missed. For the small percentage of deliveries that aren't delivered successfully, our exceptional Customer Support team comes in to its own and we take on all queries and claims on your behalf, but ask that you act quickly and provide all the information requested. Until the time is passed for a delivery deadline, be this the end of the day for a standard economy service or the cut-off point for a timed delivery, your item is not considered lost, but delayed. We will investigate the reason for this. In the event that your pallet is not delivered at all, please submit a request for support immediately via our “Live Online Chat”. Our Customer Service team will then contact the relevant parties to find out where your item is and let you know as quickly as they can what the problem is. We are incredibly responsive to queries, so please don't try to phone as well, this simply prevents our team from using their time most effectively to investigate the problem. We need all the facts from the network before we can rebook or refund a delivery, or consider the item lost. If your pallet cannot be tracked, our Customer Service team will ask the network to launch a full trace on your pallet. We will keep you routinely informed of their findings and contact you for any detailed information they might need. If the courier cannot find the shipment and confirm it lost, our Customer Service team will then pass your details on to our Claims department. They will promptly contact you to confirm the procedure for submitting a claim, which differs between networks, and they will see the claim through to its full conclusion. Until your item has been confirmed lost by Customer Service, any contact regarding making a claim will be passed to them as an ongoing enquiry for a delay. What happens if your goods arrive damaged? If your pallet arrives at its destination and is damaged, you need to notify the driver in the first instant and note the damage on the POD before signing. Then let our Customer Service team know within 48 hours of delivery., using our “Live online Chat”. They will then ask our Claims department to contact you to initialise a claim for damage and advise you of the process. You should contact us within 48 hours of your goods being delivered, you can do this via our “Live Online Chat” so that we can promptly put the wheels in motion. Some network companies accept claims after two days, but not all, therefore your claim may be refused after two days. The claims process for every pallet network we work with is different and you will be asked to provide different information depending on which network your booked with. We will reply promptly to your support request and providing we get the necessary information back from you on time, we can then submit a claim with the correct network. If we have strong evidence to support the claim, we'll always do our best to get your claim settled very quickly. What is an EROI code? If you are a business (VAT registered or non VAT registered) and ship outside of the EU (import or export), you must register for an Economic Operator Registration and Identification (EORI) code. This code identifies you to Customs as being eligible to ship internationally. Without it, your booking may be turned away by the courier. For UK businesses the format for the EORI code is "GB", followed by your nine digit VAT number, followed by three zeros. If you are non VAT registered, you must still apply for an EORI number. It must be written all in upper case and with no gaps or spaces between the information, eg. GB999999999000. You can find out if you already have a valid EORI number in this format on the European Commission website - You have only one EORI number per legal entity, so every branch of one business will use the same code. If you do not have an active EORI code, you can apply for one by downloading a form from the HMRC website and it should take only a few days for you to receive your code. You must let HMRC know if your VAT code changes. >a href="https://www.gov.uk/guidance/eori-supporting-guidance">EORI information on the HMRC website. Which CPC code do I use? The Customs Procedure Code (CPC) on your Commercial Invoice confirms the nature of movement for the goods you are shipping, be this a permanent or temporary export or an import. Without it, your order may be held at Customs resulting in significant delay. Where your export is permanent, the most common CPC code used is 10 00 001. You will find a list of other CPC codes for both permanent and temporary export in the download PDF below. Please check your code selection carefully. Import CPC - Where your import is of non-community goods or for home use, the most common CPC code used is 40 00 *** with many sub categories after 40 00 000. You will find a list of CPC codes for import in the download PDF below. Please check your code selection carefully. Visit the HMRC website - or call the Excise and Customs Helpline on 0845 010 9000 to determine the correct CPC code. What commodity code do I use? The Commodity Code (or Tariff Code - these are the same thing) on your Commercial Invoice confirms what the goods are that you are shipping. Couriers require a detailed description of the items you are sending. The Commodity Code is a classification code used by Customs and so we recommended you always supply one to avoid any delay between borders - if the Commodity Code is requested, your goods will not pass through Customs until it is provided. If you have supplied a Commercial Invoice with your shipment, but a required classification code is missing, your order will be held until an amended Commercial Invoice showing this is received. The classifications are very specific and must be accurate, so search thoroughly for descriptions. You can phone the HMRC Tariff Classification Service on 01702 366077.